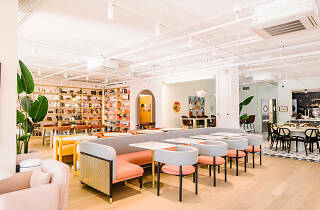 On the surface, the Wing is a picturesque paradise: The 8,331-square-foot female-centric coworking space is accented with playful wallpaper and colorful furniture. Bright, beautiful artwork hangs from the walls, and massive windows allow natural light to creep into every nook and cranny of the space. Splayed across shelves that stretch the length of the room, hundreds of books are organized by color to create a rainbow effect. But take a closer look and you'll find loads of substance and nods to Chicago throughout the Wing's Fulton Market location, which opens at 811 W Fulton St in the West Loop on April 11. The interior design is inspired by Frank Lloyd Wright, with muted tones and hexagonal tile work. The walls are adorned with artwork from Chicago-based, female-identifying artists like painter Candida Alvarez, photographer Elizabeth De La Piedra and sculptor Soo Shin. (Guests have the option to purchase the pieces they love.) The bookshelves are curated with tomes from Women & Children First, an Andersonville bookstore known for its focus on feminist and kids literature. One of the conference rooms is dedicated to journalist and activist Ida B. Wells. Even the café serves dishes from local female chefs, including a little gem salad from Monteverde's Sarah Grueneberg and matcha-dipped strawberry custard bars from Pretty Cool Ice Cream's Dana Salls Cree. "When you come to the Wing, the hope is that you're meeting the women of Chicago who are building the city—in tech, startups, healthcare, nonprofits—we want to be a clearinghouse for those folks to come together and discuss their ideas and move each other forward," says Zara Rahim, the Wing's senior director of strategic communications. 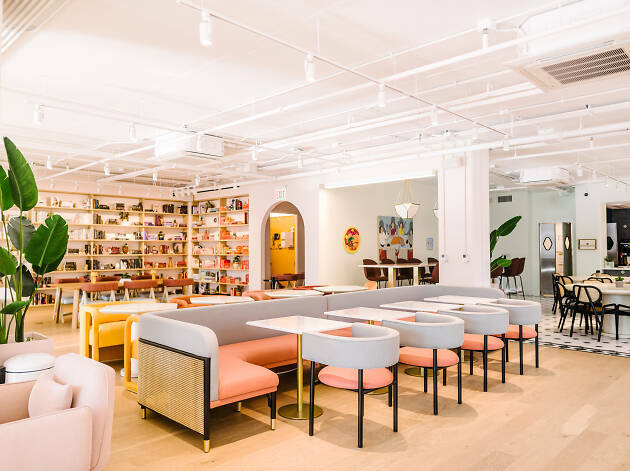 With locations in New York, San Fransisco, Washington, D.C., and beyond, The Wing's secret sauce seems to be its attention to detail. Inside the women's lounge, there's a serene nursing room with extra pumps, dim lighting and a cloud-like chair. The bathrooms are outfitted with Chanel perfume and Carol's Daughter hair products. The trendy furniture scattered throughout the club is designed with a woman's average height in mind. This isn't your average coworking and social space. The Wing is now accepting applications for perspective members to join its Chicago outpost, with monthly dues ringing up at $185 per month (or $250 per month to get access to any Wing location in the country). A spokesperson from the Wing says that the group's female-focused policy is inclusive of "GNC, non-binary, and trans members who may not identify as women." This weekend, the Wing will host two public-facing events—a reading from Valerie Jarrett as well as a conversation about gun safety with Everytown and Moms Demand Action—both of which are free with RSVP. In the meantime, take a look around the stunning Fulton Market space below.